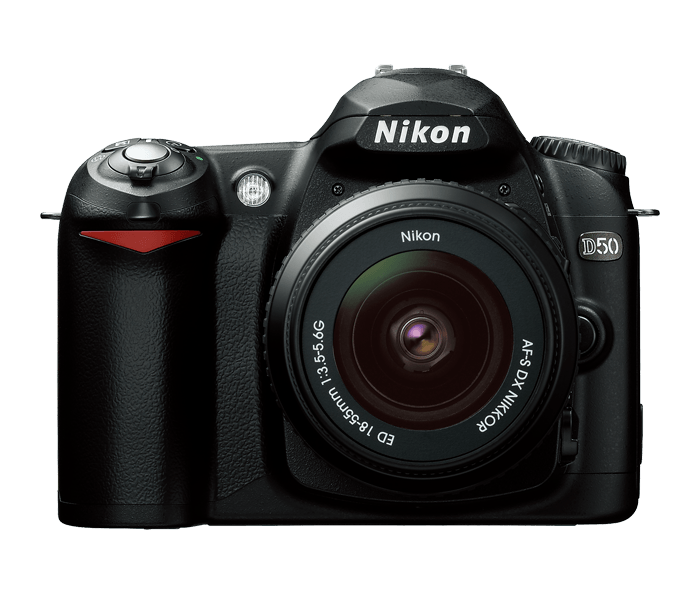 Compact, Lightweight and Easy to Use: The Nikon D50 is easy to take with you anywhere you go! From its inviting body contours to its easily accessible controls, this is a camera that makes picture taking satisfying and fun! High performance 6.1 Effective Megapixel Nikon DX Format CCD Image Sensor: The D50 delivers vivid color and sharp detail with high resolution for great pictures and enlargements. High-Quality Nikkor Optics including NEW Compact and Lightweight AF-S DX Zoom-Nikkor 18-55mm f/3.5-5.6G ED Lens: The new D50 offers seamless compatibility with Nikon's extensive family of high-performance AF Nikkor lenses, as well as the expanding family of DX Nikkor lenses, providing superb color reproduction, razor-sharp image clarity and fast and accurate autofocus performance. 7 Digital Vari-Programs: The next evolution of Nikon's scene-optimized Digital Vari-Program modes produces great results for the intended shot, while freeing you to concentrate on the moment. New Child mode makes it easier to take memorable pictures of the children with the right amount of vivid color and contrast straight from the camera. Choose from Auto, Portrait, Landscape, Child, Close Up, Sports, or Night Portrait. Incredible Battery Performance - with EN-EL3 Rechargeable Battery: The EN-EL3 rechargeable lithium-ion battery increases energy capacity to shoot approximately 2,000 images. The new Quick Charger MH-18a is smaller than the original MH-18, and is capable of charging both the EN-EL3a and EN-EL3 batteries. Large, 2.0-inch LCD: provides immediate feedback when viewing images and aids smooth operation with a new easy-to-view, easy-to-understand menu design and instructive help dialogs. High-performance digital processing: employs exclusive Nikon technology to render vivid color and clear details with all the speed necessary to freely capture those precious moments as they unfold. Refined 5-Area Autofocus System: The D50 has a refined 5-area autofocus system that features speed, precision, broad frame coverage, and class-leading low-light detection that makes it easy to take great pictures in low light situations. An automatic autofocus illuminator is also provided when taking pictures with the built-in Speedlight or when using the optional SB-600 or SB-800 Speedlights. 2.5 Frames Per Second with Uninterrupted Shooting up to 137 Frames: High-speed continuous shooting assures uninterrupted shooting up to 137 frames*, while shutter speeds from 30 to 1/4,000 sec., and flash sync speeds up to 1/500 sec. provide the capability to capture images not possible with non-SLR type cameras. *When using JPEG NORMAL - Large settings, and a SanDisk Ultra II SD Card (256MB). The number of continuous shots possible in a single burst may be fewer depending on the type of SD card used. 3D Color Matrix Metering II: The D50 incorporates a 420-pixel RGB sensor for accurate exposure control in all types of lighting situations. By comparing the scene to a built-in database of various lighting patterns, the camera's light meter can accurately produce your best pictures ever. New Small Picture Function: A one-button email option, this feature saves photos in the camera at the reduced sizes of 640x480, 320x240, or 160x120, perfect either for mail attachments or for use on a web page. i-TTL and Nikon's Creative Lighting System: Makes taking pictures with flash as easy as turning the flash on! Easy multiple flash lighting is possible using the new Nikon Creative Lighting System. Add an SB-600 Speedlight for more power and coverage for flash photography. Responsive Performance: Shutter speeds from 30 to 1/4,000 sec. and flash-synchronized shutter speeds of up to 1/500 sec. provide a photo experience with greater breadth and creative flexibility to catch more of those important picture moments. Previously referred to as Optimize Image in the manual.